One thing any gallery of emo hair pics will show is that there are no limits when using emo hair styles to express yourself. While all emo hair cuts have some common characteristics, the key is to find a look that works for you and shows your independence. A classic bob hair style, for example, may not seem very emo, but adding a slight taper and sharp, long bangs over one eye gives this look a distinctive emo edge. 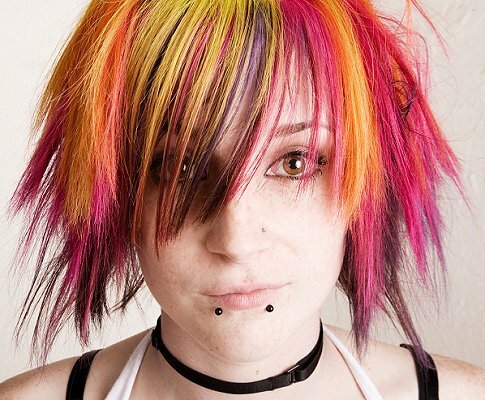 Emo hair styles often use unique hair colors. Layering contrasting colors is a popular option, but the colors don't need to be dark. A light blonde hair base covered with red hair highlights is a fun and expressive choice. Bold two tone hair color is a striking emo style. To make the color even more stark, choose thick chunks of color or layer one side of the head in one color while the other side contrasts. Coloring the bangs or framing the face are other popular options. Many guys wear emo hair styles, and they can choose a range of different looks to show their personalities. Longer, straight hair with heavy side bangs is a simple but popular emo style. Spikes, shags, and bed head hair styles are other choices. Any hair style can have an emo edge with the right accent. A surprising spike, jagged bangs, colored tips, razored layers all add attitude to a look for an emo feel. Sharp hair spikes are an easy emo look to achieve. Use hair gel to mold short hair into uniform spikes, or for a more alternative hair style, create thicker spikes at odd angles all over the head. Textured layers are a beautiful emo hair style. To show off the layers, use a sculpting paste or hair gel to smoothly separate them into thick locks, but avoid using so much gel that the style is stiff or sticky. Sassy emo hair has a flip to the ends that adds volume and shows off the razored or textured ends. Ragged bangs are another common characteristic of emo hair that is easy to use with any hair style or length. Long hair can be emo with the right attitude. A bold, unusual color such as rich red or deep black stands out in a long, simple style. Use a sedu flat iron and smoothing serum to keep longer hair sleek and silky. An angled ponytail is a fun and flirty emo look. Pair the ponytail with a side part, long bangs, and razored edges for an everyday emo look to show off your playful side. Adding a variety of stark hair highlights to long hair can give it an emo edge. In darker hair, opt for bright blonde or white highlights, or for even more of an alternative look, go for bright colors such as purple, blue, pink, or green. A bed head hair style can be emo if it is worn appropriately. Keep the look mussed and use a texturing paste to separate the ends for more distinction.